push volumes in the market as it doubles investments and hopes to catch a sizeable portion of the still-developing leisure biking segment in India while also going aggressive overseas in the US and countries across Europe. Part of the Eicher group, the company is revamping its product portfolio with new age engine technology — like electronic fuel-injection system and electric starting — as it looks to modernise the company's motorcycles but yet maintain the classic and retro looks that has been the mainstay of the company's products, including the Bullet, for years. The company on Wednesday launched its all-new model in India — the 500cc Classic — that is designed around Royal Enfield's 'J2', a model that shot to prominence around the early 1950's. "Blending yesteryear's charm and today's technology, the Classic is a tribute to the glorious machines of the past and is ready to roar into the future," said Siddharth Lal, MD and CEO of Eicher Motors. Enfield India was formed in 1955 to make civilian and military models under license from the original British manufacturer that unveiled the first Bullet in 1932. Bullet production in England ended in 1962, but Enfield India kept producing them and began exporting to Europe in the 1980s. The company hopes that with new technology straddling on the classic looks, its appeal to the younger audience of the west will be stronger while also remaining an attractive option in the domestic market where demand has been bulging for expensive bikes as more and more Japanese and Indian players like Hero Honda, Bajaj and Yamaha introduce newer fast-running machines. 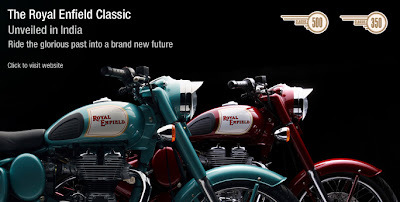 Lal, however, said Royal Enfield has no plans to pitch its bikes in competition with Japanese and Indian rivals, but rather rely on the appeal for the company's classic looks that give its bikes a cult status. The company has priced the 500cc Classic at Rs 1.24 lakh while pricing a 350cc version at Rs 98,000 (ex-showroom Delhi). The company has been selling the 500cc Classic in European markets since October last year and has managed to sell around 2000 units so far. Lal said the company hoped to sell 50000 units between various models, though over 90% of the sales would still be fetched from the domestic market. 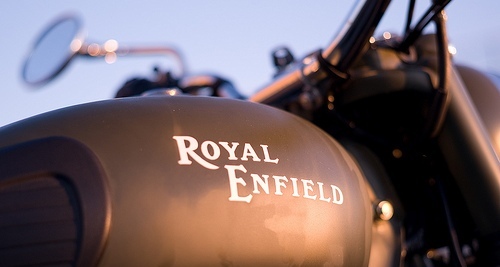 Hope royal enfield keeps living up to its name-with bigger and better products. And let's hope this is just the start of a fresh new exciting beginning. Glad re have such competent people now as their heads. The bikes comes with the normal catalytic converter exhaust and the new exhaust which is flashed in the picture is an add on to the bike (accessory) comes at a extra cost and has a better thump and feel. As bound by the name “Classic” it carries a typical retro look, but when taken a closer look there is loads of differences from the old once… for the first time they have managed to change the wheel base and the tires that makes the bike little shorter. 500 and 350 has respective defining color -aqua blue for 500 and gray for 350 .. black n maroon is common in both the models. i wish the gray comes with 500 too..
there are many more changes .. for which u have to see ur self..
i love the bike inspire of the change..
Classic 500 – on road Bangalore is RS 1.42 L!!!!! I’ve made up my mind to pick up the 500C but waiting to see the reviews from the auto shows before i book..
Hi bought classic 500cc on 10th dec'09. It's a great bike no questions about it. But have problems with the battery. Infact from the lot which I got the bike it seems 10 out of the 18 bikes have this problem due to the faulty batteries supplied by EXIDE company and they currently don't have stock to replace the faulty battery. So have to wait for 10 days... :(. The classic 500 cannot be driven without a battery at any point of time. So this seems to be 1 bad point of it. With many years of experience and expertise in the field of Chevy / GM motors - you will be delivered a high quality engine that we are willing to stand behind for 7 full years - 70,000 miles! so this an amazing.